THERE were plenty of interesting numbers to come out of the second week of the NAB Challenge, none more so than the stats produced by a couple of expensive rookies that may just be worth the extra outlay. It was also good to get a little preview of what we can expect from a few of the under-priced Bomber top-ups. It was all about the Dogs, with Jake Stringer (FWD, $419,000) putting his hand up for selection with a dominant performance over the first three quarters, going on to finish the game with 92 Fantasy points from 17 possessions, six marks and three goals. True to pre-season rumours, Stringer spent plenty of time up the ground, adding a string to his bow as a talented forward. Lachie Hunter (MID, $433,000) has been on my radar and he did not disappoint, playing a Fantasy friendly role on the wing with 83 points from 25 touches. The Bont, Marcus Bontempelli (MID, $511,000) was tagged and quiet by his standards and he looks to be in for a tough year with opposition teams putting a lot of time into minimising his impact on games. He had 17 touches and scored 64 from 81 per cent game time. There was not a lot of Fantasy relevance from the Giants, but Rory Lobb (RUC/FWD, $296,000) was the pick of them, taking six marks and kicking two goals on his way to 81. The Cats and Pies will be two of the more Fantasy relevant teams this season and their pre-season hit-out did nothing to suggest otherwise. Patrick Dangerfield (MID, $589,000) did not disappoint on debut for the Cats, leading the way with 105 from 28 touches and three goals. Fellow first timer in the hoops, Zac Smith (RUC, $389,000) has thrust himself into consideration with an impressive performance, scoring 72 from 71 per cent game time. Nakia Cockatoo (FWD, $199,000) looked much improved and dangerous in front of goal for 58, while Mark Blicavs (RUC/MID, $539,000) just rolled the legs over for 35 from 36 per cent game time. The disappointing news was popular midfield bargain Sam Menegola (MID, $127,000) going down with a knee injury after starting the match in fine form, collecting seven possessions and scoring 29 from just 17 per cent game time. Steele Sidebottom (MID, $565,000) was his usual classy self, leading all scorers with 119 from 28 touches and he looks set for a huge season. Jordan De Goey (FWD/MID, $342,000) was the main man, however, spending a lot of time in the midfield and doing a bit of everything with 24 touches, six marks and six tackles for 102. His forward eligibility will make it hard to say no. Dane Swan (MID, $609,000) played forward and kicked three goals without reaching second gear and the Pig looks almost guaranteed to receive forward status in round six if this game was anything to go by. He also collected 10 touches and scored 60. Many eyes were on James Aish (DEF/MID, $293,000) and he did just enough to stay in the mix with 15 touches and 46, while Mason Cox (RUC/FWD, $125,000) could find himself on many benches after impressing with two goals and 43 points. Matthew Lobbe (RUC, $431,000) was well beaten in the ruck, and scratched off a few watchlists after scoring just 60 from 84 per cent game time, while Sam Gray (FWD/MID, $427,000) remains an interesting player to continue to track after collecting 19 possessions and scoring 48 from just 64 per cent game time. Having said that, he will need to improve his kick to handball ration that read an uninspiring 4:15. Max Gawn (RUC, 509,000) has to be considered as a set and forget ruck. He is coming off a great breakout season and looks set to continue his improvement after dominating with 42 hit-outs, 17 touches and a team-high 92 points. Jack Viney (MID, $462,000) impressed without tagging duties with 28 touches and 86 points, while Ben Kennedy (FWD/MID, $221,000) remains a person of interest after scoring 62 from 15 touches and a goal. Clayton Oliver (MID, $238,000) looks set to be a handy cash cow after collecting 11 possessions and scoring 41 in just 57 per cent game time. Bachar Houli (DEF, $481,000) looks set for another great season, and could be a draft slider to watch after an impressive performance against the Hawks where he had 34 touches and seven marks for 116. Speaking of draft sliders, Brandon Ellis (MID, $568,000) could be another forgotten man on draft day, despite being a proven Fantasy gun, he can get overlooked for bigger names and certainly looks ready to go after a polished 29 touches and nine marks for 109 points. Connor Menadue (FWD/MID, $138,000) was good and is certainly one to keep an eye on after kicking two goals and scoring 67 in 77 per cent game time. And the only way to describe Dustin Martin (FWD/MID, $573,000) is LOCK. The Hawks put their feet up this week, but Liam Shiels (MID, $549,000) looks set provide a late steal in Fantasy Elite, carrying on his good form from last year with nine tackles and 91 to lead the Hawks ahead of 'player of interest' Taylor Duryea (DEF, $436,000) who scored 70 from just 12 touches. The good news however, was that Daniel Howe (DEF, $265,000) backed up his great game against the Blues with another impressive performance, recording the Hawks third highest score with 69, including eight tackles. He is almost a must have in the backline at this stage. From the Blues perspective, it was all about Jacob Weitering (DEF, $232,000). He was outstanding in the backline and did enough to justify his inflated price tag, showing poise and ability well beyond what his age and experience would suggest. He took nine marks and gathered 19 possessions for a score of 78 and I have seen enough to say lock and load. The great backline hope Ciaran Byrne (DEF, $125,000) was given more game time this week, notching up 80 per cent time on ground, but unfortunately that wasn’t reflected in his scoring, managing just nine possessions and 34. 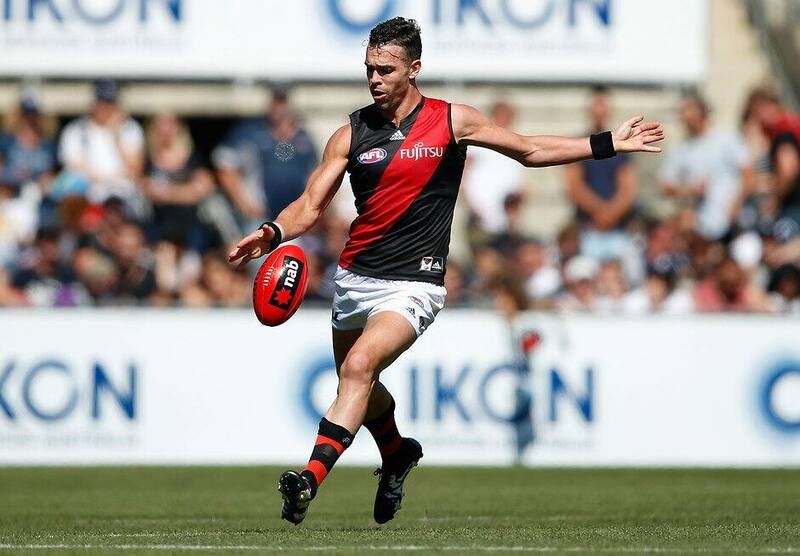 David Zaharakis (MID, $415,000) looked good as the main man in the middle for the Bombers with 28 touches and a game-high 101 points, but Mitch Brown (DEF, $194,000) was the man we all cared about and he didn't disappoint, running the show in the backline with eight marks and 83 to all but confirm a starting spot on our ground. Ryan Crowley (MID, $226,000) was good for his price, collecting 17 possessions and kicking one goal, which should have been two and would have pushed his score over 80. He relished the chance to have a run around without following an opponent and provides a genuine option as a cash cow. Craig Bird (FWD/MID, 321,000) was solid, laying an impressive nine tackles on his way to scoring 67 from just 60 per cent game time, keeping his name well and truly in the mix. Darcy Parish (MID, $260,000) was excellent, collecting 18 possessions and taking five marks on his way to 64 from just 58 per cent of the game, indicating the sky is the limit for the back-to-back under 18 All Australian ball magnet. Any injury concerns over Nat Fyfe (MID, $581,000) have been cleared up after another outstanding game from the superstar. Once again he did as he pleased, collecting 26 possessions and kicking two goals for a team-high 98 points from 85 per cent time on ground. Michael Barlow (FWD/MID, $515,000) needed just 68 per cent game time to score 90, justifying himself as a walk-up selection in classic and an Elite bolter with his role change and forward eligibility. Matt Crouch (MID, $396,000) continued his ball magnet ways with 26 disposals and 105 from … wait for it … just 68 per cent game time. If you are on the hunt for a mid-priced player in the midfield, look no further. Rory Laird (DEF, $489,000) looks a great option across all formats, having no trouble finding the ball in the back half with an impressive 29 disposals and 86 points.